So you're ready to take the dive and get hitched to that special girl, maybe you've already given her that ring you've been carrying around and now it's time to start looking for yours. As a guy, you probably haven't put a whole lot of thought into what kind of jewelery suits you. Just keep in mind that this is something you'll be wearing (hopefully) for the rest of your life. You can pick from the nice selection of mass produced wedding bands at your local mall, but if having a ring that's a little more unique interests you then there are several alternatives to choose from. It's my goal to put my search skills to the test and track down a few of the more allusive choices out there, and I'll be updating the list as I find new sources so be sure to check back often. Hope my wiki helps you find the ring you're looking for and congratulations! I could have squeezed this section in with artisans, but I think etsy sellers deserve their own spotlight. Etsy is an online community where people can sell their handmade items. Everything from jewelry to quilts to soaps and everything in between, including wedding bands. I searched through their 40,000 jewelry sellers and found several wedding band crafters and some of the rings were very unique. By the way, I happen to have an etsy store so if you'd like some affordable handcrafted bracelets and necklaces, check out http://charmedbyaustin.com/. Ok, shameless plug over, moving on. Posey rings gained their popularity in the 16th, 17th, and 18th centuries when it was common to give your beloved a ring engraved with a small poetic quote. Today those rings are on display at various museums, but using the lost wax method exact replicas have been made that make for an interesting wedding band with a bit of old-school romanticism attached. Seriously, how cool would it be to have a ring made out of a meteorite? Well amazingly enough there are a few different sources for them. Usually they're made from the Gibeon meteorite (which scattered 150 tons of metal in Gibeon, Africa) and have a very masculine look to them. This is a great choice if knowing that your ring was once hurtling through space is something that's important to you. The ogham alphabet, also known as "the secret language of poets" was used in the 4th to 7th centuries AD. Each letter translates into lines and slashes which look very attractive when carved into a ring and allow you to add a secret message that only you and your partner can read. Surprisingly, it's not illegal in a lot of countries to take a metal detector, find a bunch of really old (like 1000-2000 years old) relics and keep them. Now a days people do this for a living and sell what they find to online vendors who in turn make them available for you to purchuse. Ancient bronze rings were made to last, and if you don't mind being patient, it's completely possible to find a very cool wedding band that someone wore back in caesar's day. Keep in mind, these don't come with a warranty and how durable your ring is will probably vary greatly from ring to ring. But there is something undeniably cool about these treasures, and a bronze ring will shine like gold when you have it cleaned. These rings are made by forging different metals together to form unique patterns. The look of the ring will depend on which metals are used and the combinations are endless. The result is a ring that really stands out, and with this process no two rings are ever alike. My dad once made my mother a ring out of a nickel, it's one of her favorite things. I looked around and found a few companies online that specialize in rings made out of old coins. Silver dollars, half-dollars, and quarters mostly. They look very wedding band-ish and have a lot of built in character. 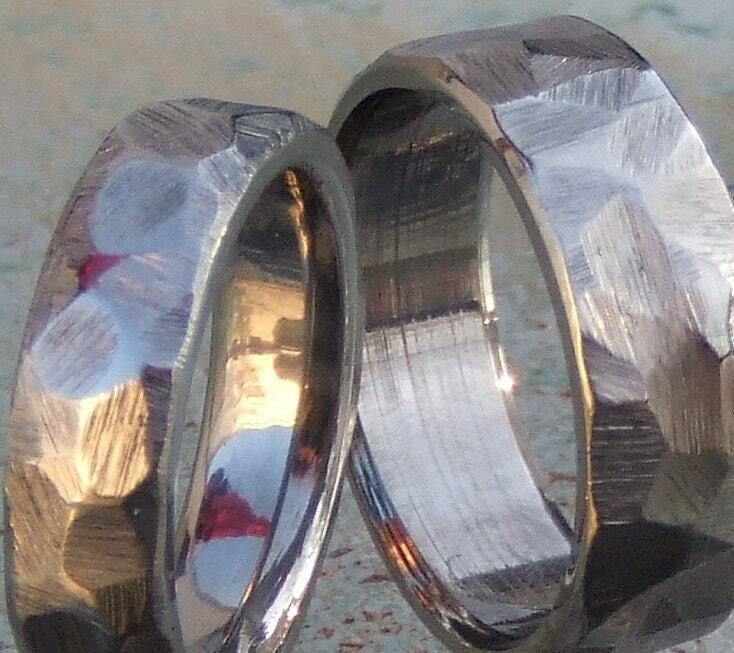 I think these would make a very interesting choice for any guy who likes the look and feel of silver rings. The ring is made by weaving bands together leaving a knot on the top of the ring. While not technically a wedding band, many men wear this ring because the "love knot" represents two souls intertwined forever. The design originated in the Irish fishing village of Claddagh in the 17th century. It features two hands clasping a heart, usually surmounted by a crown. The ring's popularity is world wide now and is often handed down as family heirlooms. I had to add the "one ring" to the list. This is a great choice for the couple that loves lord of the rings, I say couple because you should probably get your finance's opinion before opting for this ring. But it does have a nice look for guys who like displaying their geekier side. For a truly personal touch, you can have your partner's fingerprint engraved on your ring. These come in a number of modern styles and, depending on the ring, you can choose to have the fingerprint on either the inside or outside of the band. If you're the forgetful type, the Remember Ring might be for you. As of right now, it's just a concept item but there is a company working on it. The idea is that the ring will warm to a slightly uncomfortable degree for 10 seconds every hour starting 24 hours before your anniversary. For those of you who like the look of wood but want the certain durability of metal, how about a ring with a wood inlay? You can choose from a number of exotic woods for a ring that is sure to stand out.